When photographing sports, you can set your camera to specific settings in an effort to match the camera settings to the goals you wish to achieve. Sport specific settings can help as much as adjusting your timing based on the sport you're photographing. Whether subjects are moving quickly, in an erratic manner, or following the same line around a track, use the following settings as a starting point to improve your photographs. The following tips were created with the D4 D-SLR in mind, however you can adjust most of the settings regardless of which Nikon D-SLR you're shooting with, just check your camera's manual for specifics. Most team sports such as soccer or rugby will put the photographer in the position of trying to photograph a subject that is partially obscured by another object or when the focus shifts quickly between nearby and distant subjects. To counter this, set your camera’s settings to the following: AF-C Priority Selection to RELEASE, AF-Area Mode to DYNAMIC AREA AF (9 points) and Focus Tracking with lock-on to 3 (normal). When photographing sports where subjects are often obscured by other athletes for example at a track event select a long lock-on to maintain focus on your subject. AF-C Priority Selection should be set to RELEASE or FOCUS + RELEASE, AF-Area Mode to DYNAMIC AREA AF (9 points) and Focus Tracking with lock-on to 3 (normal) to 5 (long). For subjects that appear in the viewfinder suddenly or are hard to track, such as diving or ski jumping, increase the number of dynamic-area focus points. This will ensure the camera will focus based on information from surrounding focus points if the subject briefly moves out of the selected focus point. This is most effective when there is separation between the subject and background. In this case, set the AF-C Priority Selection to RELEASE, AF-Area Mode to DYNAMIC AREA AF (21 points) and Focus Tracking with lock-on to 3 (normal). 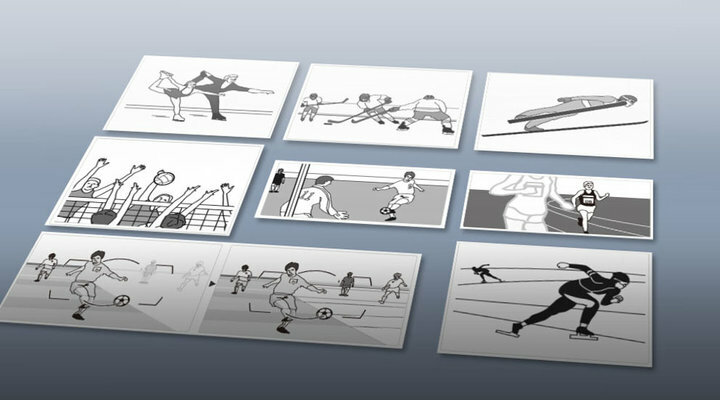 For sports where you’re normally going to be using the outer focus points, such as speed skating, increase the number of dynamic-area focus points by one level when framing pictures in portrait orientation. When photographing ball sports and in other situations where precise timing is not a priority, choose FOCUS + RELEASE for the AF-C Priority Selection, AF-Area Mode of DYNAMIC AREA AF (21 points) and Focus Tracking with lock-on of 3 (normal). When photographing sports such as figure skating where the subjects are moving rapidly or when you’re changing the camera orientation (from portrait to landscape) often, increase the number of dynamic-area focus points. When shooting pairs skating events, increase the lock-on time. This will help when subjects may be obscured by their partner, to keep the camera from focusing on the background in the gap between subjects. For improved framing, set the Custom Setting a10 (on the D4) to YES to store points by orientation. AF-C Priority Selection should be set to RELEASE, AF-Area Mode to DYNAMIC AREA AF (9 or 21 points), and Focus Tracking with lock-on to 3 (normal) or 5 (long). When shooting sports with subjects that move or change rapidly (for example in hockey or when alternately framing the pitcher and a runner when shooting baseball from the bench) reduce the lock-on times for improved response. Set the AF-C Priority Selection to RELEASE, AF-Area Mode to DYNAMIC AREA AF (9 points) or Single point AF and Focus Tracking with lock-on to OFF or 1 (short). When shooting volleyball or swimming—sports where the time between focus and shooting is short or where there are obstacles between the autofocus target and the camera, use Single-point AF to prevent the camera from focusing on obstacles such as the volleyball net or splashes in the pool. Also set the standby timer to 1 minute or longer for improved shutter response. AF-C Priority Selection should be set to RELEASE, AF-Area Mode to Single-point AF, and Focus Tracking with lock-on to 3 (normal). To reduce camera blur, choose a VR setting suited to the subject you’re shooting. For moving subjects at a shutter speed of 1/500 second or faster, it is recommended that you turn VR OFF because blur is less likely in these instances. When panning shots of moving subjects or photographing stationary subjects, select ON/NORMAL to reduce the effects of vibration. When you’re taking photos from a car, boat, helicopter or other unstable platform, select ACTIVE. Note though, that the image in the viewfinder may be affected by panning or excessive vibration. When shooting on a tripod, select TRIPOD mode, however, use NORMAL when you are not using a fixed tripod head or if you’re using a monopod.